Participate in the ECC – here's how! On the Naviki start view tap on 'Settings'. Firstly log in at the Naviki app, then select 'Contests'. You have to be registered at Naviki in order to log in. In the view 'Contests' select 'ECC2017'. It is possible to participate in further Naviki contests in case they happen simultaneously. Activate the switch 'I'm participating' – that's all you have to do to take part. Afterwards you can select your team(s) after tapping on 'My teams'. 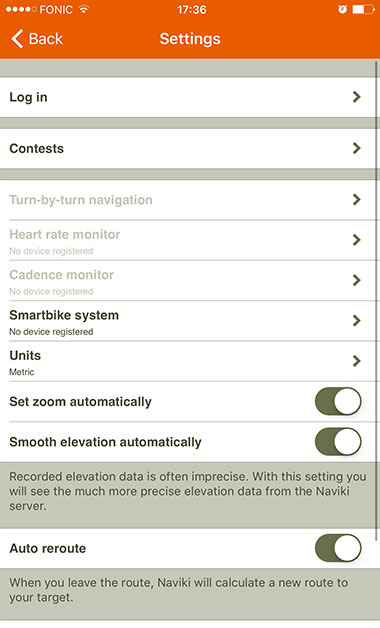 Naviki automatically includes all recorded trips in your ECC ranking, even those you recorded during the ECC period before you declared participation. In case you leave a team and select a new team instead, all recorded trips will disappear from the ranking for the team you left. They will appear for the new team you selected instead. 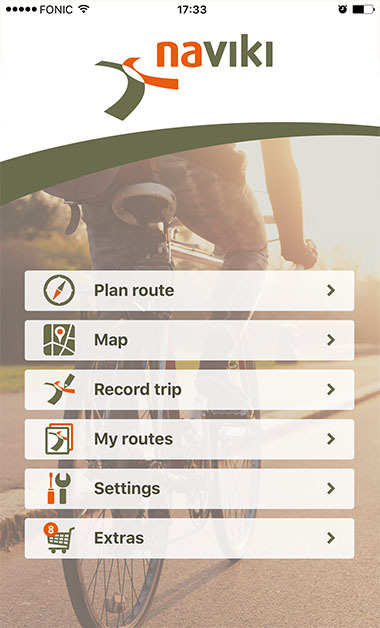 Before you start a bicycle trip, simply tap 'Record trip'. After you finished the trip, select 'Stop record' and save your route. If you use Naviki to navigate on a planned route via the 'Start navigation' button, Naviki automatically records your trip. Select 'Stop record' and save your route after such trips as well. For Android users: After you finished a trip, tap the Android Back Button of your phone (bottom left below the display). You will then see an option to save your route. Naviki automatically includes all recorded trips in the ECC ranking. If one of your trips doesn't count for the ECC or if it counts with a reduced amount of km, please check the ECC rules. 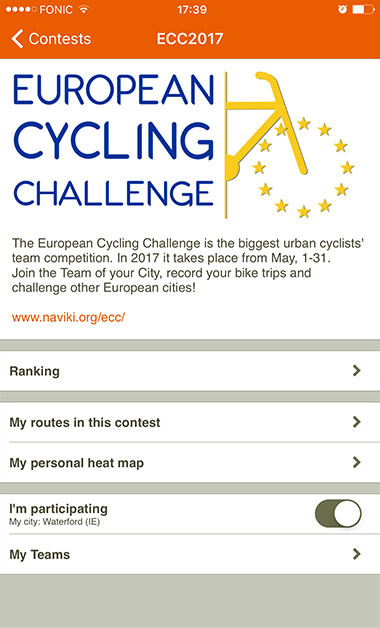 Tap on "Ranking" in order to see up-to-date ECC personal and team leaderboards within your Naviki app. Go to the ECC website to access further leaderboards regarding the current ECC. Have good trips and all the best! 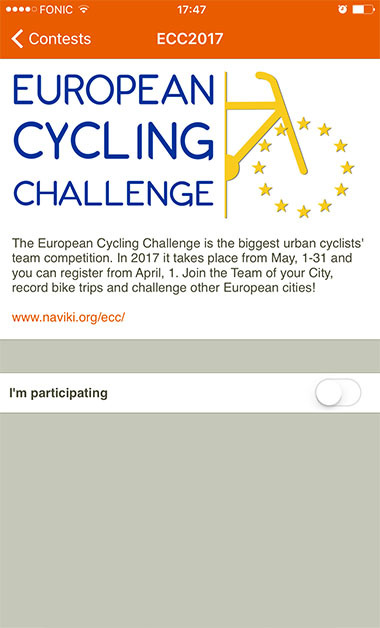 Naviki is the official smartphone app and data service provider for the European Cycling Challenge (ECC). Naviki is a service by beemo. Authorised representatives: Prof. Dr. Gernot Bauer, Dipl.-Geogr. 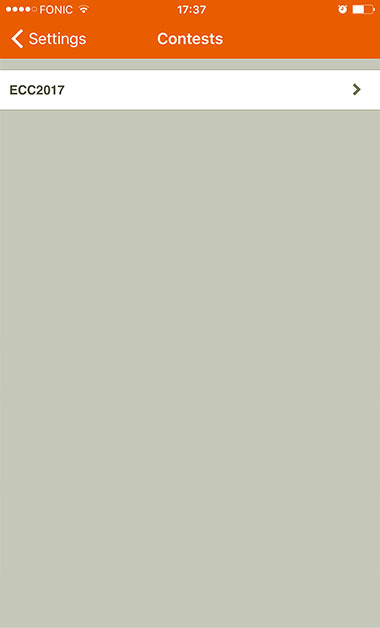 Achim Hennecke, Sven Luzar M.Sc.